The biggest names in the aerospace industry will be on display at this event; one that expects 7,000+ attendees from all over the globe. To some, MRO Europe is the best place to view, test and purchase new MRO products and service solutions, and we really look forward to showing you the many ways STS can support your company’s aerospace staffing, engineering, line maintenance, manufacturing, aircraft repair and modification, as well as your company’s aircraft component requirements. Participants and guests of the conference can explore 17,000 sqm of exhibition space showcasing 400+ solution and service providers. You can also expect breakout sessions highlighting aircraft market forecasts and key trends, the dynamics and trends of MRO partnerships, supply chain and predictive maintenance collaborations between OEM and MRO teams and so much more! Special events are also scheduled to take place; events like Pratt & Whitney’s hosted session that will detail an airline’s perspective on ways enhanced technology has played a major role in aircraft selection. You can also experience live and interactive Heli Tech demonstrations in the “Go-Live” Demo Theatre! Again, you can find the STS Aviation Group team at booth 523 within the ExCel London Exhibition and International Convention Centre. Key members from STS AeroStaff Services, Air-Pro, Component Solutions, Engineering Solutions, AeroMod and Line Maintenance teams will all be on site to discuss all of your aviation industry requirements. “2017 has been a phenomenal year for STS Aviation Group as we have added four new divisions, new OEM product lines and so many other service capabilities designed to help get you off the ground and back in the sky,” explained David Ikeda, Vice President of OEM Distribution and EMEA Sales for STS Component Solutions. The entire STS team is very excited to once again be a part of Europe’s leading MRO conference and exhibition where airlines, suppliers, MROs, OEMs, and other aviation industry experts connect to collaborate and improve the aviation maintenance industry. 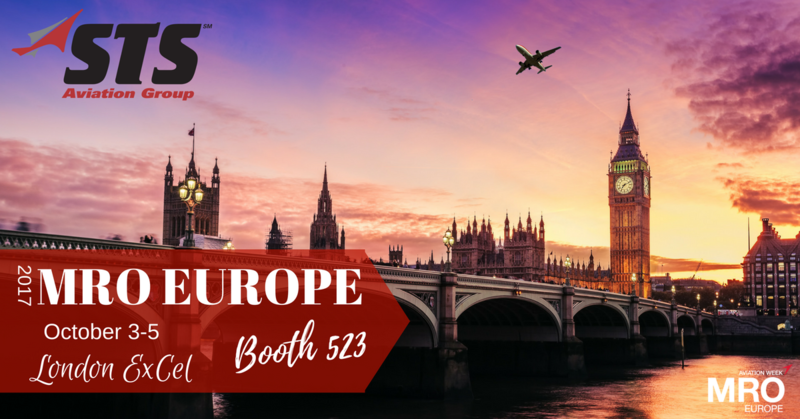 Remember to fly by booth 523 to meet the STS team, and we really look forward to seeing you in London!